Start off your visit on the 16th (Sun): delve into the distant past at Colosseum, get to know the fascinating history of Piazza Navona, contemplate the long history of St. Peter's Basilica, then admire the striking features of Pantheon, and finally ponder the design of Trevi Fountain. To see more things to do, maps, photos, and tourist information, go to the Rome day trip app . Chicago, USA to Rome is an approximately 13-hour flight. You can also do a combination of flight and train. Traveling from Chicago to Rome, you'll lose 7 hours due to the time zone difference. In September, daily temperatures in Rome can reach 81°F, while at night they dip to 60°F. Finish up your sightseeing early on the 17th (Mon) so you can travel to Sorrento. Explore the numerous day-trip ideas around Sorrento: Ravello (Duomo di Ravello, Villa Rufolo, & more) and Amalfi (Duomo di Sant'Andrea & Wine Tours & Tastings). There's still lots to do: indulge in some culinary diversions at a local gastronomic tour and make a trip to Piazza Tasso. For maps, where to stay, photos, and more tourist information, you can read our Sorrento tour itinerary planner . Do a combination of train and subway from Rome to Sorrento in 3 hours. Alternatively, you can drive; or take a bus. Traveling from Rome in September, expect somewhat warmer with lows of 68°F in Sorrento. Finish your sightseeing early on the 20th (Thu) so you can travel to Florence. Florence is known for museums, historic sites, shopping, classes, and nightlife. Your plan includes some of its best attractions: admire the masterpieces at Uffizi Galleries, make a trip to Piazzale Michelangelo, snap pictures at Ponte Vecchio, and see the interesting displays at Galleria dell'Accademia. To find photos, maps, and other tourist information, go to the Florence online holiday planner . Getting from Sorrento to Florence by combination of subway and train takes about 4.5 hours. Other options: drive; or do a combination of subway, flight, and train. Traveling from Sorrento in September, expect slightly colder with lows of 59°F in Florence. 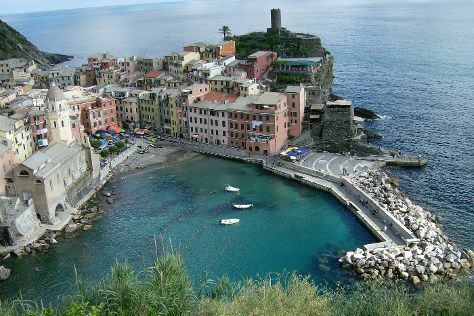 Finish up your sightseeing early on the 23rd (Sun) so you can go by car to Cinque Terre. Kick off your visit on the 23rd (Sun): hike along Cinque Terre Trails, get into the urban bustle at Vernazza, and then trek along Footpath Monterosso - Vernazza. Get ready for a full day of sightseeing on the next day: explore the wealth of natural beauty at Parco Nazionale Cinque Terre. To see more things to do, reviews, other places to visit, and tourist information, go to the Cinque Terre route planning site . Traveling by car from Florence to Cinque Terre takes 2.5 hours. Alternatively, you can take a train. In September, daily temperatures in Cinque Terre can reach 78°F, while at night they dip to 59°F. On the 25th (Tue), you'll have the morning to explore before heading off to Milan. Kick off your visit on the 25th (Tue): admire the striking features of Galleria Vittorio Emanuele II, then take in the spiritual surroundings of Duomo di Milano, and then appreciate the extensive heritage of Piazza del Duomo. To see more things to do, other places to visit, reviews, and more tourist information, use the Milan online tour builder . Getting from Cinque Terre to Milan by train takes about 3 hours. Other options: drive. In September, plan for daily highs up to 76°F, and evening lows to 57°F. You will have some time to spend on the 26th (Wed) before leaving for Copenhagen. Copenhagen is known for theme parks, historic sites, museums, nightlife, and parks. 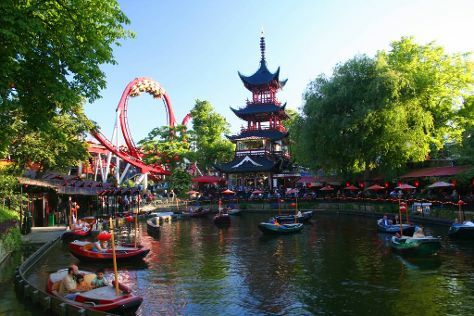 Your plan includes some of its best attractions: get in on the family fun at Tivoli Gardens, see the interesting displays at Ny Carlsberg Glyptotek, make a trip to The Little Mermaid (Den Lille Havfrue), and enjoy breathtaking views from Rundetaarn. To see other places to visit, photos, traveler tips, and other tourist information, read our Copenhagen holiday maker . Traveling by flight from Milan to Copenhagen takes 5 hours. Alternatively, you can drive; or take a train. Prepare for a bit cooler weather when traveling from Milan in September: high temperatures in Copenhagen hover around 65°F and lows are around 51°F. You'll have a few hours on the 29th (Sat) to wrap things up before traveling home.